The book can be ordered from Masalai Press or from Amazon.com. Wantok, the Pidgin English (Tok Pisin) newspaper of Papua New Guinea (PNG), has published a series of folk tales sent in by readers from around the country since 1972. I have collected and edited these folk tales, and have translated them into English through 1997. I have indexed them by author, village, original language, province, flora and fauna, and motif. There is also a list of folktale titles that I have translated into English. 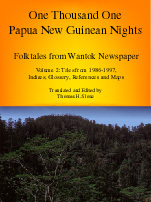 Rather than index culture group, which is not well-standardized in PNG, the name of the local language used in the village from which each story originates is indexed. The names for the language index are primarily based on Dutton (1973), Laycock (1973), Wurm (1975), Wurm (1976), Wurm and Hattori (1983), and Z’graggen (1975). Generally, only distinct languages are indexed, not dialects. The current count of languages in the index is 247. This represents 35% of Papua New Guinea’s total language count (about 700, according to Wurm, 1985). There are probably stories in the manuscripts from many culture groups that have not elsewhere had their folk tales published. All of PNG’s provinces are represented as well as one story each from the Torres Strait of Australia and Biak in Irian Jaya. Some provinces are better represented than others, particularly those in which Tok Pisin is the lingua franca. A motif index (based on Thompson, 1993; Kirtley, 1955; Kirtley, 1971; Legman, 1968; Legman, 1975; and Hoffmann, 1973) is included. A set of maps showing the known locations of villages is included. The village locations are based on the village gazetteer by Peterson et al. (1982). I have described my technique for determining the languages associated with PNG villages here. Despite my substantial effort at this, there are still villages that I have been unable to precisely locate. These are located here. If you know where any of these are, please contact me. I have been unable to locate issue number 1138 from 1996 of Wantok. Please please let me know if you can send me the ancestor story from this issue. Dutton, Tom E. (1973). A Checklist of Languages and Present-Day Villages of Central and South-East Mainland Papua. Series B, Number 24. Canberra: Pacific Linguistics, The Australian National University. Out of Print: Search Amazon.com for this book. Hoffmann, Frank (1973). Analytical Survey of Anglo-American Traditional Erotica. Bowling Green, OH: Bowling Green University Popular Press. Out of Print: Search Amazon.com for this book. Kirtley, Bacil Fleming (1971). A Motif-Index of Traditional Polynesian Narratives. Honolulu: University of Hawaii Press. Out of print: Search Amazon.com for this book. Laycock, Donald C. (1973). Sepik Languages -- Checklist and Preliminary Classification. Series B, Number 25. Canberra: Pacific Linguistics, The Australian National University. Out of Print: Search Amazon.com for this book. Legman, Gershon (1968). Rationale of the Dirty Joke: An Analysis of Sexual Humor. First Series. New York: Grove Press. Out of print: Search Amazon.com for this book. Legman, Gershon (1975). No Laughing Matter. Rationale of the Dirty Joke: An Analysis of Sexual Humor. Second Series. New York: Bell. Out of print: Search Amazon.com for this book. Moore, Carmella. C. & Romney, A. Kimball (1994). Material culture, geographic propinquity, and linguistic affiliation on the north coast of New Guinea: a reanalysis of Welsch, Terrell, and Nadolski (1992). American Anthropologist 96: 370-396. Peterson, Boyd D., Garren, William R., and Heyda, Charles M. (1986). Gazetteer of Papua New Guinea: Names Approved by the United States Board on Geographical Names. Washington, DC: Defense Mapping Agency, 588 pp. Out of Print: Search Amazon.com for this book. Thompson, Stith (1993). Motif-Index of Folk-Literature. Bloomington: Indiana University Press, CD-ROM ed. CD-ROM edition in print! Volume 1 is in print! / Volume 2 is in print! / Volume 3 is in print! / Volume 4 is in print! / Volume 5 is in print! / Volume 6 is out of print. Welsch, Robert L., Terrell, John & Nadolski, John A. (1992). Language and culture on the north coast of New Guinea. American Anthropologist 94: 568-600. Wurm, S. A. (1975). New Guinea Area Languages and Language Study. Volume 1. Papuan Languages and the New Guinea Linguistic Scene. Pacific Linguistics, Series C, No. 38. Canberra: Australian Academy of the Humanities. Out of Print: Search Amazon.com for this book. Wurm, S. A. (1976). New Guinea Area Languages and Language Study. Volume 2. Austronesian Languages. Pacific Linguistics, Series C, No. 39. Canberra: Australian Academy of the Humanities. Out of Print: Search Amazon.com for this book. Wurm, Stephen A. (1985). “Indigenous languages.” In: Papua New Guinea Atlas: A Nation in Transition, David King & Stephen Ranck, eds. Bathurst, New South Wales: Robert Brown. Out of Print: Search Amazon.com for this book. Wurm, S. A. & Hattori, Shirô, eds. (1983). Language Atlas of the Pacific Area. Part I. New Guinea Area, Oceania, Australia. Pacific Linguistics, Series C, No. 67. Canberra: Australian Academy of the Humanities. Out of Print: Search Amazon.com for this book. Z’graggen, John A. (1975). The Languages of the Madang District, Papua New Guinea. Pacific Linguistics, Series B, No. 41. Canberra, Australia: The Australian National University. Out of Print: Search Amazon.com for this book. © 2001 by Thomas H. Slone. Last modified September 24, 2002.